The Unmanned: Drone book launch in Venice. 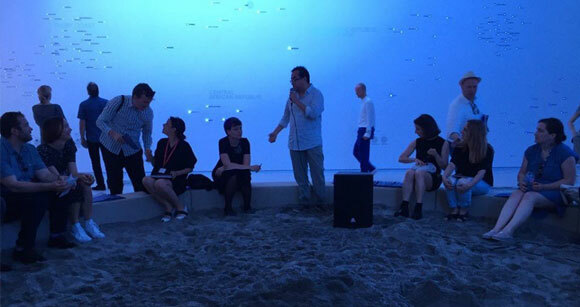 It was under the blue hues of the Dutch Pavilion at the 2016 Venice Architecture Biennale that we presented the first e-book of the Unmanned: Architecture and Security series. Titled Drone, this first issue combines several essays on the topic with reports on two events that took place at Studio X and Het Nieuwe Instituut. I was thrilled to be able to assist the very talented team of editors – Ethel Baraona Pohl, Marina Otero Verzier and Malkit Shoshan – in the making of this volume with dpr.barcelona, and was happy to participate in the launch discussion, where the editorial team was complemented by respondents Anna Puigjaner and Tamar Shafrir.